Tag line: "This Ride Will Be The Death Of You"
Final Destination 3 follows the same basic formula as both Final Destination and its 2003 sequel. Fortunately for director James Wong and his team, that formula still works. McKinley High’s class of 2005 is enjoying a night at the local carnival, and fellow senior Wendy Christensen (Mary Elizabeth Winstead) is snapping digital photos of everyone, some of which will appear in the upcoming yearbook. Spurred on by her boyfriend Jason (Jesse Moss), Wendy agrees to ride the carnival’s main attraction, the “Devil’s Flight” rollercoaster. Joined by their friends Carrie (Gina Holden) and Kevin (Ryan Merriman), Wendy and Jason hop aboard the ride, but before it begins Wendy has a premonition that the coaster is going to break apart. After begging to be let off, she, along with Kevin and a handful of others, climb out of the coaster and head for safety. Sure enough, the disaster that Wendy predicted comes true, killing those who stayed on board (including Jason and Carrie). Several days later, two of the girls who left the rollercoaster early, Ashley (Chelan Simmons) and Ashlyn (Crystal Lowe), die in a freak accident. It’s at this point Wendy starts to suspect that everyone who got off the ride early cheated death, which has now come back to settle the score. Armed with the photos taken that fateful evening (many of which seem to predict how the "survivors" are going to die), Wendy and Kevin set out to warn the others. But as the fatalities mount, they realize their time is running out. As with the series’ previous outings, the kill scenes in Final Destination 3 are amazingly creative, starting with the rollercoaster tragedy that kicks everything off (at one point, the heavily damaged coaster stalls while going through a loop, leaving everybody hanging upside-down. A few people try to escape by undoing their safety belts, only to fall hundreds of feet to their doom). But that’s just the beginning; over the course of the movie, we watch as a number of everyday items, including tanning booths and weight benches, are transformed into killing machines. And while questionable CGI sometimes takes the edge off of them, the deaths in Final Destination 3 are pretty spectacular. 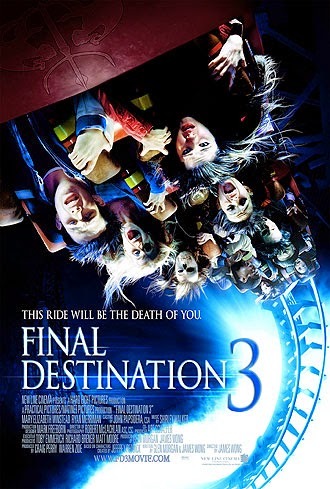 A third movie that’s as entertaining as the first two, Final Destination 3 proves you can never get too much of a good thing. My daughter and I have been watching horror movies for about twenty-five together starting when she was young. She usually decides which ones we head to the theater or DVD for. I didn't think I'd like Final Destination, but each of them have been really good. They seem to stay fresh. The stories have been engaging and the creative ways the characters meet their demise are most creative. In short, they are entertaining, nothing more, nothing less, and in today's horror world that's just fine. Ron: Thanks for the comment! And you sum up perfectly how I feel about this franchise: it's entertaining! These movies won't exactly challenge you, but if you want to have some fun, they'll deliver in a big way!